With the rise of multiplayer voice chat comes the rise of headsets. This once-luxury peripheral is now about as standard as a mouse and keyboard when it comes to the core PC gaming crowd. And as with the mouse and keyboard, there's plenty of competition. Boutique brands have pushed the headset to soaring price points, with the Astro A40 and the SteelSeries Elite coming in at $200, and the wireless Astro A50 coming in at a wallet-murdering $300. It doesn't have to be that way, though! Regardless of whether you're a gaming headset veteran or just want to test the waters without breaking your budget, there are plenty of affordable, entry-level headset options that will have you screaming orders in the heat of battle for well short of $100. With 2014 wrapping up, we gathered a handful of sub-$100 headsets and put them in a five-way brawl. At the low end of the price spectrum—the most entry-level of entry-level headsets—was the SteelSeries Raw Prism, coming in at a budget-friendly $60. 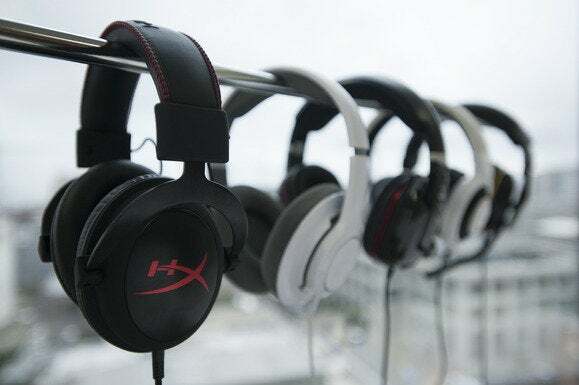 The other four headsets we reviewed all came in at $80: Kingston's HyperX Cloud, the newly-rebranded Corsair Gaming's H1500, GX Gaming's scorpion-esque Cavimanus, and a special glossy white edition of Razer's Kraken Pro. We ran the headsets through a battery of tests, both design- and audio-oriented. Design is a tricky one with headsets, encompassing everything from the shape of the earcups to the durability of the headset to the materials used to overall comfort. It also tasks us with watching for some "luxury" features—for instance, in-line controls, or controls built into the headset that allow for on-the-fly volume control and muting. Then there's the headset itself. While the focus is always on graphics in games, audio is just as important. The sharp crack of a gunshot, the low, ominous strains of a cello as you enter a haunted house, or even just the meaningless prattle of Sims—these all add to your enjoyment of a game, and you'd better be hearing the best the game has to offer. And hey, maybe you'll want to use this headset for music and movies as well as games! How does that experience sound? We tested each headset with a wide variety of sounds, from test tones to TV to films to music to games. As far as games are concerned we tested mostly with shooters, which tend to have the most involved sound design of any modern experiences. Battlefield 4 is a great reference, if you want to throw on a new headset and put it through its paces. And then there's the microphone, which makes a headset a headset and not just a simple pair of headphones. Detachable mics, retractable mics, omnidirectional nubs—we've got them all in this round-up, and it's a factor that weighs just as heavily on the score as the audio. Without further ado, let's dive in. We'll have a roundup of more extravagant headset purchases soon, but for now here's your guide to 2014's budget-friendly headsets: SteelSeries's RAW Prism, Kingston's HyperX Cloud, Corsair Gaming's H1500, GX Gaming's Cavimanus, and the white Razer Kraken Pro. The GX Gaming Cavimanus has bass-driven haptic feedback built into its budget innards, plus 7.1 support. 7.1 Surround and a black-and-yellow color scheme are the stand-out features of this headset. Kingston doesn't have the same pedigree in the headset space as its competitors, but the HyperX Cloud is a winning device at a cheap price. The SteelSeries RAW Prism is one of the most affordable headsets on the market, at $60, but you get what you pay for.